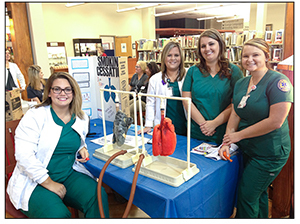 In September, the Macon County Public Library, in partnership with Southwestern Community College’s Health Science division, hosted a community Health Fair. This fair provided guests with the opportunity to learn about health fields, mental and physical diseases and, perhaps most importantly, disease prevention. The library displayed health-related books for guests to browse or borrow and even offered a nutrition-based story time for younger patrons. Representatives of several vendors from throughout the area - as well as all 15 of SCC’s Health Science programs - were present at the fair. Most offered an interactive component. The American Red Cross was on site collecting blood donations, and SCC’s Medical Assisting students offered guests the chance to sign up for the National Bone Marrow Registry while the Macon County Police Department taught about the dangers of leaving children and pets in an unattended car. Whether guests chose to relax with a free chair massage, spin the wheel with Smoky Mountain Pregnancy Care Center, or learn more about their current health with one of the many free screenings and services offered by SCC’s student groups, much fun was had by all! The community Health Fair is an annual event hosted each fall by SCC’s Health Sciences division. If you missed out this year, we look forward to seeing you next time! Thank you for this opportunity and for partnering with SCC for this year’s Health Fair!